On 20th June Software Group and eFellows hosted a discussion dedicated to the new opportunities emerging in the field of online payments after the implementation of PSD2 (Payment Service Directive). The financial services sector will be affected the most. Kalin Radev, CEO of Software Group, and Rostislav Rusev, COO of eFellows, opened the event and presented the expected key changes. 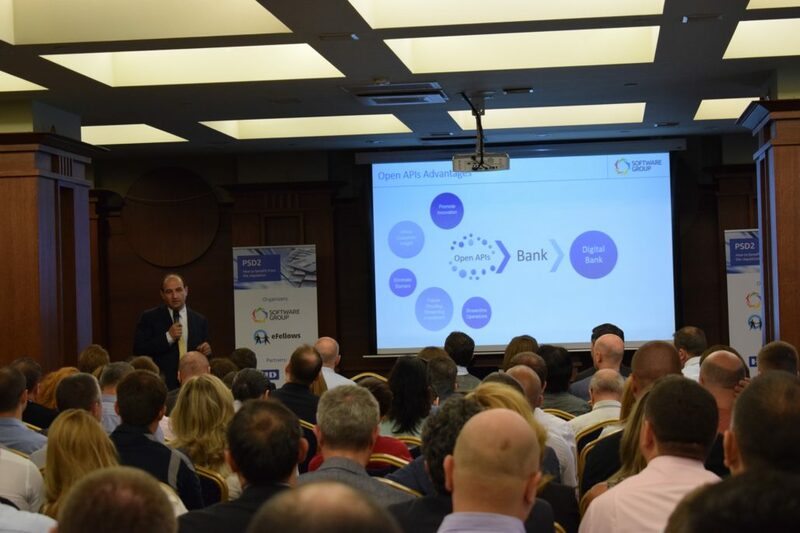 Over 100 participants from leading banks in Bulgaria attended the discussion. “The consumers are becoming more demanding in their expectations towards the financial institutions. The organizations that can offer their customers a bigger variety of innovative services, corresponding to these expectations, will be the ones that will be most successful”, explained Kalin Radev. He added that the new regulation can be an opportunity for banks to create an infrastructure, that is both flexible and suitable for the market, and is also meeting the growing needs of the customers. The revised payment services directive, which comes into force on 13th January 2018, will facilitate the entry of new players on the bank services market, as well as FinTech companies. The regulation’s main objective is the liberalization of the way such services are being offered by encouraging innovation and providing an easier and more secure payment process for consumers. The changes coming from this regulation will impact banks and other financial service providers. On one hand, banks will have to meet the data security requirements and give access to the data through APis. On the other hand, banks will have to adapt to a new competitive environment of open banking and start offering innovative services. New business and innovation opportunities will be open to other financial service providers as well. Konstantin Stoytchev, Senior Manager “Management Consulting” from Deloitte spoke about the impact of the new directive on the future of banking. “Banks can choose from three approaches – reactive, according to which they can change their operations in compliance with the regulation; cooperative – to partner with the newcomers on the market, or progressive – to rethink their model of banking, according to the opportunities provided by PSD2”, he commented. Mr. Stoytchev also added that banks aren’t limited to only providing traditional banking, and that there are examples of banking institutions that have founded FinTech companies in order to remain competitive.